Yesterday, Kent Dinlenc ’19, an Arts senior staff writer who also wrote for Forum section, resigned from the Justice. Dinlenc also serves as the Class of 2019 senator and as chair of the Union’s Sustainability committee. 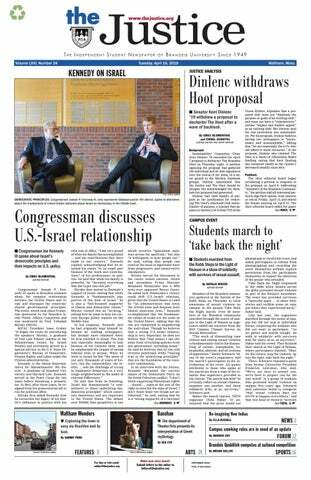 A few days ago Dinlenc circulated a survey on social media regarding the two newspapers on campus. His involvement in such matters poses a significant conflict of interest. Aware of this conflict, the Justice requested a meeting with Dinlenc to ask him for his resignation, which Dinlenc began the meeting by voluntarily offering. The Justice appreciates all the work Dinlenc has done, as well as his choice to address the conflict of interest his memberships created. —Editor's note: This letter has been updated to include a clarification regarding the circumstances surrounding Dinlenc's resignation.